Well, the answer is in. 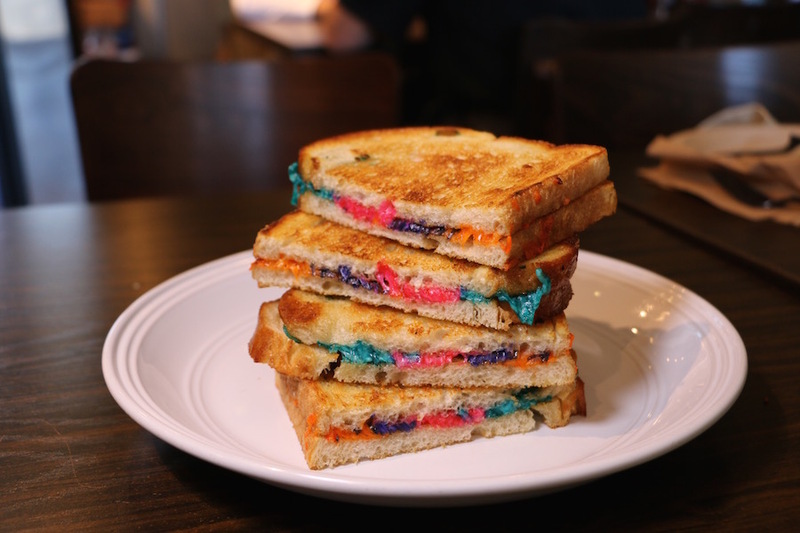 The new ‘Unicorn Melt’ grilled cheese sandwich debuted today in Los Angeles at Santa Monica’s very own Chomp Eatery & Juice Station. To create the new melt Chef Windy of Chomp Eatery experimented using various organic food dyes (such as beet juice) to achieve the colors, then layered individual strips of each colored cheese to achieve the rainbow effect. We Like L.A. co-founder Christina Minh and I stopped by for lunch this afternoon and the version we tried was a simple combo of Monterey Jack on sourdough bread. Unicorn Melt grilled cheese at Chomp Eatery. 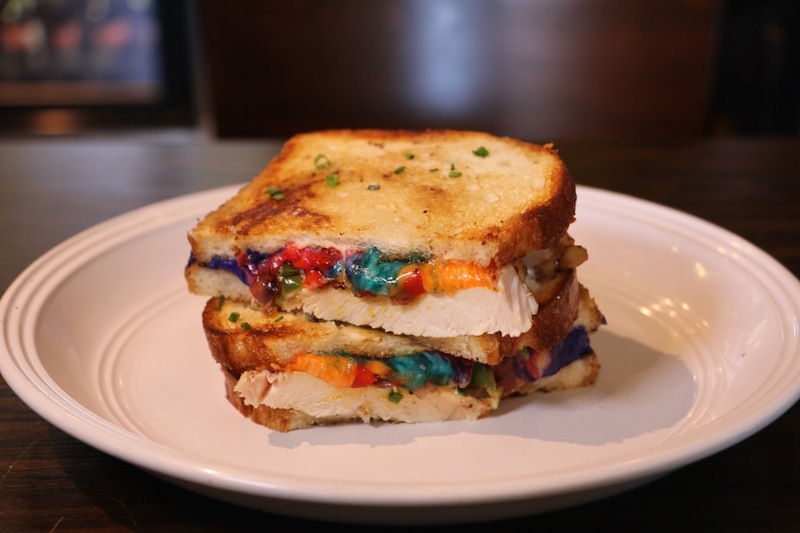 Photo credit: Brian Champlin / We Like L.A.
Unicorn Melt with chicken. Photo Credit: Brian Champlin / We Like L.A.
Bottom line: The first time you pull this thing open, it’ll surely brighten your day. Cheesy goodness. Photo credit: Brian Champlin / We Like L.A. The standard Unicorn Melt clocks in with not-too-shabby price tag of $6, but note in the video embed below we were showcasing double-cheese version of the Unicorn Melt (extra melty! ), which adds another $1.50 to the bill. Pro-tip: If you’re looking to make your Instagram feed blow up, you’ll definitely need to add the extra cheese. 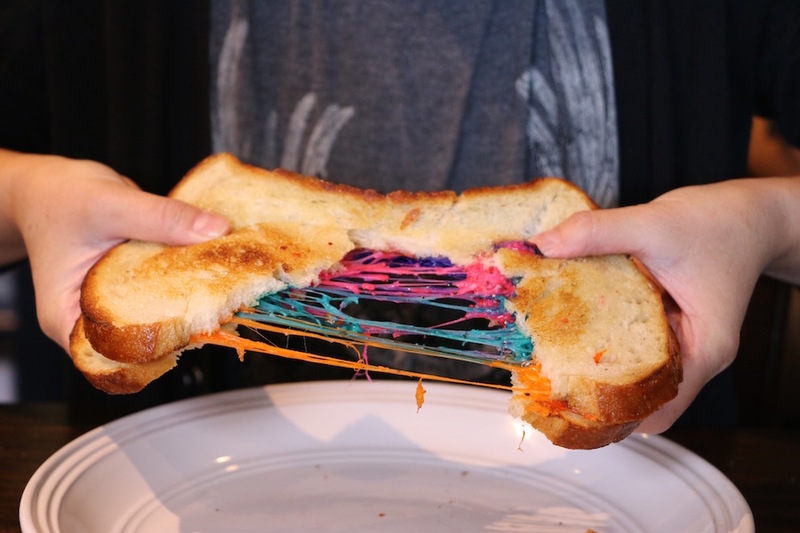 For the uninitiated, the first ‘unicorn’ style grilled cheese sandwich to attain viral fame is from Hong Kong’s Kala Toast, which recently scorched earth on social media showcasing a variety of multi-colored melted cheeses flavored with lavender (purple), basil (green) and tomato (red). Now stories of the colorful creations seem to be everywhere, with sites like Pop Sugar even launching rainbow melt recipes for readers to try for themselves. Sufficed to say that while Chomp may be the first to capitalize on the craze here in L.A., it’s doubtful they’ll be the last. Chomp Eatery & Juice Station is located at 1612 Santa Monica Blvd. Santa Monica, CA 90404.